Edward Price from the BBC Singers supported this year’s event, running inspiring afternoon workshops to prepare the young performers for the evening concert. As a professional singer, Edward has performed at an elite level for over 20 years, singing with leading conductors and orchestras all over the world. 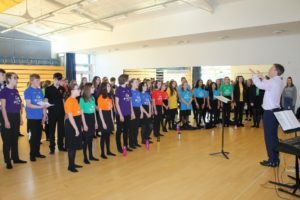 For the evening performance, the singers wore brightly coloured t-shirts to bring together the participants from the different schools. 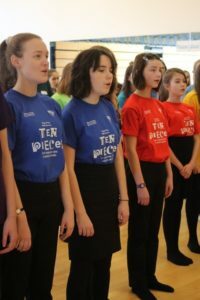 In the stunning finale, the children performed ‘No Place Like…’ by Kerry Andrews, a complex and challenging piece, written for BBC Music’s ‘Ten Pieces’ project and first performed at the BBC Proms last year. At the end of the concert, Mr Newton, Wyvern Headteacher, thanked Edward Price for his enthusiasm, skill and direction which made the concert such a success.